Ayshire branch regret to inform you that retired Detective Constable, Joseph Merry (80), died at his home in Troon, on Friday, 30th November, 2018. 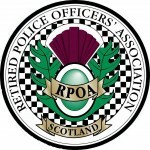 Joe was a member of the Ayrshire Constabulary, his first 10 years of service being in uniform, in the Saltcoats area. He was appointed Detective Constable at Irvine, then served in the ports unit at Prestwick, returning briefly to CID Irvine, before being transferred to the ports unit Glasgow, from where he retired in 1993. He is survived by his wife Pamela and daughter Victoria. The funeral service is at 11.30 a.m., on Wednesday, 12 December, 2018, at Holmsford Bridge Crematorium, Dreghorn.